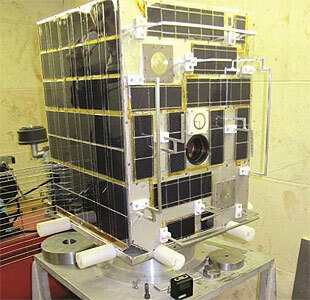 Sharif-Sat is an iranian small experimental satellite built by the Sharif University of Technology. SharifSat was built by a group of students at Sharif University of Technology and delivered to INSA in December 2013. It is a 50 Kg imaging and store and forward communication satellite. It has passed all the operational and environmental tests successfully, and is planned to be launched in LEO orbit. Most of its subsystems are indigenously. These include magnetic sensors and actuators, fault tolerant OBC, communication transmitters and receivers, antennas, solar panels, camera and image compression engine, heat pipes, and isogrid structure. Reportedly the imaging payload has a ground resolution of about 12.5 m.